MWDs—The Forgotten Veterans, Who Are They? There are a few vets that won’t be getting discounts at their favorite store or diner today in honor of Veteran’s Day. Who are they? They’re MWD’s, Military Working Dogs. I must confess that I’ve never thought about “man’s best friend” being a war hero until I read about the United States’ first ever national monument being dedicated to combat dogs. Unveiled in October 2013 at Lackland Air Force Base in San Antonio, Texas, the nine foot bronze statue features a handler and four dogs representing the major breeds used since World War II: Doberman Pinscher, German Shepherd, Labrador Retriever, and Belgian Malinois. John Burnam, who handled dogs during the war in Vietnam, said he got the idea for a memorial after military officials decided not to let dogs working in Vietnam return to the United States with their handlers. “They were heroes, and they were left to die,” said Burnam. It’s estimated that war dogs saved over 10,000 U.S. lives in Vietnam. Now, I knew I wanted to learn more about these furry freedom fighters. 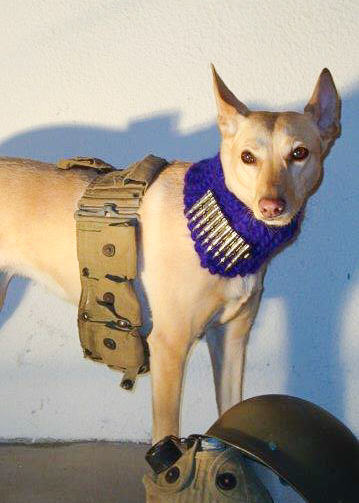 What does it take to be a war dog? Number one qualifier is being sensitive to smell. When a dog sniffs the air, odor molecules enter its nostrils. These tiny, airborne particles travel to a membrane that contains about 220 million scent–detecting cells. That’s 40 times more than humans have. That’s why a dog gets much more information from a whiff of air than we do. Dogs’ noses are so powerful that they perform even better than machines. “Dogs find stuff that our sniffing technology can’t find,” says U.S. Marine Gunnery Sergeant Greg Massey. Massey heads up the Military Working Dog Program at the U.S. Marine Corps headquarters in Virginia. When there is little or no wind, a dog can detect intruders up to an eighth of a mile. With a little bit of wind, they can detect odors more than half a mile away! In training, the dogs learn the various odors associated with improvised explosive devices, or IEDs. Typically made from fertilizer and chemicals, and containing little or no metal, those buried bombs can be nearly impossible to find with standard mine-sweeping instruments. In the last few years, IEDs have become the major cause of casualties in Afghanistan. Today, dogs are trained to sniff out both homemade and commercially made devices. Some dogs are specially trained to not only detect stationary bombs or bomb-making materials, they can identify and alert their handler to the moving scent of explosive devices and materials left behind in the air as from a suicide bomber walking through a crowd. 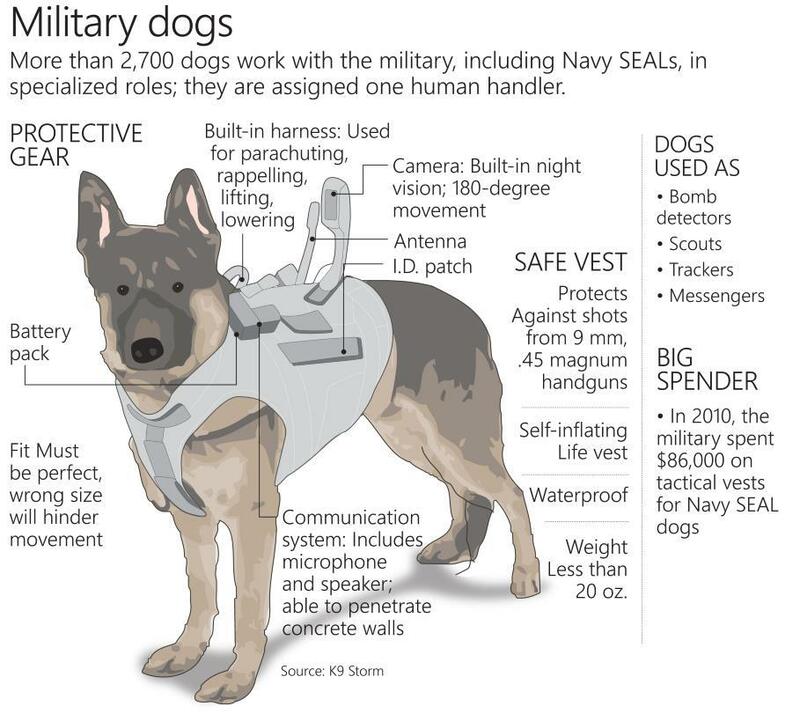 These “vapor-wake dogs” cost around $20,000 each. Dyngo, a working dog in Afghanistan spent over 1,000 hours in a field with his handler to uncover 370 lbs of explosives and a total of four IEDs that would have for sure killed the 20 soldier unit. In 2011, they were award the Bronze Star. The most celebrated military dog is Cairo who was assigned to the elite Navy Seals team that hunted down the world’s most wanted terrorist, Osama bin Laden. The fact that Cairo was on the mission proves that the military working dog is one of the military’s most valuable assets. Dogs are the front detail. They are first to enter buildings to see what’s inside and walk in front of their units to sniff for bombs. They even parachute out of airplanes with their handlers. Dogs can re-enlist for several tours of duty until they are about 9 years old at which time they are retired or adopted. Just like soldiers, it’s been found that military dogs suffer from a type of canine PTSD– or post traumatic syndrome. A doctor in Afghanistan once called into a behavior specialist telling how his patient had just been through a firefight and was now cowering under a cot, refusing to come out. Even chew toys didn't work. Most likely something or someone had re-triggered that dog’s mind to think “when I see this kind of individual or object, things go boom, and I’m distressed.” One 12 year old vet named Treo still searches every room in his house for non-existent explosives. Treatment can be tricky since the patient can’t explain what’s wrong. Care can be as simple as taking a dog off patrol and giving it lots of exercise, playtime and gentle obedience training.More serious cases are handled by “desensitization counter-conditioning, which entails exposing the dog at a safe distance to a sight or sound that might set off a reaction–a gunshot, loud bang, or vehicle. If the training is successful, a dog can return to duty. Some are even treated with anti-anxiety drugs, like Prozac. We ask dogs to do a lot for us. They are neither bulletproof nor free from fear and emotions. Let’s remember that and do something compassionate and kind for a dog today in honor of these special furry vets. I know that my love and respect for dogs has just increased a thousand times. While my Maru isn’t exactly a war hero, she is still a hero to me. And in tribute to her fellow canines around the world, she salutes them for their bravery! There a several websites dedicated to making the Retired Military Working Dog Adoption process easier for those interested in giving these war heroes a forever home. About 300 retired U.S. military dogs are put up for adoption each year. Based in Northville, MI, Stiggy’s Dogs provide psychiatric service dogs to military veterans and active limited duty veterans with a diagnosis of post traumatic stress disorder (PTSD), Traumatic Brain Injury (TBI) or related disorders. The cost to train, certify, and house a dog is apx $4,000 – and dogs are FREE for VETS …along with a crate, bedding, toys, shots, and more.